As part of the ADA upgrade project, Nash Hall Restrooms 208 (Men’s) and 306 (Women’s) will be closed. Water shutdowns will be scheduled next week and a separate notice will be sent for that work. As part of the Magruder Hospital Expansion project, the North parking lot is closed for construction. Temporary reassignment of parking on east side lot across from Magruder Hall (map). Moving client parking for small animal clinic to parking lot 3284, lot will have signage showing the portion that will be for clients, rest of lot is open as usual. For questions or comments on this closure, contact Dave Raleigh at 541-230-0804. Posted in Magruder Hall, Parking Lot Closures, Parking Lot Impact, Parking Space Closure. During the week of Spring Break, March 25 – 29, the following gravel parking lots will be closed for grading and leveling. Vehicles parked in these lots may be towed. During these closures, you may park in another parking lot within your permitted zone. The lots may reopen early as the work is completed. 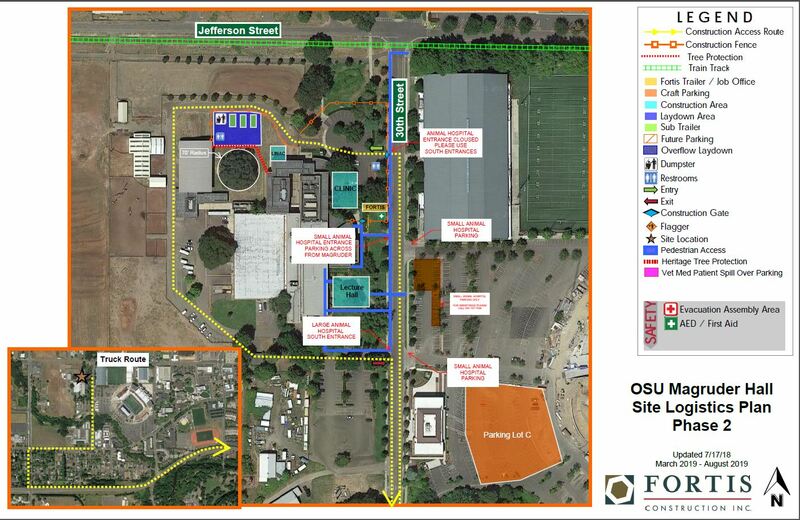 For questions or comments on this closure, contact Transportation Services at parking@oregonstate.edu or by calling 541-737-2583. Posted in Parking Lot Closures, Parking Lot Impact.